The Total Gym STEP is a brand new attachment that is similar to the squat stand, with the added benefit of being engineered to provide rebound. The platform is rectangular in shape, so it has a little more surface area than the squat stand, which is an oval. Its springiness allows it to absorb impact energy and transmit it back into the body so you can jump higher. Total Gym STEP is not to be confused with the traditional step aerobic platform, which sits on the floor and can be used with risers to increase intensity. Total Gym STEP’s energy-absorbing springs decrease impact forces to make exercise gentler on the joints. It’s ideal for those who are recovering from injuries and those who need an extra boost to get their feet off the ground, such as the elderly, because it enhances balance and stepping strength with very little impact on the joints. For basic platform work and circuit training that involves no impact and is low intensity, the Squat Stand and the STEP are the same when no jumping is involved. You can do squats, knee lifts, kicks and presses on the STEP where one or both feet are always on the platform. (The Cyclo Trainer is also great for low-impact aerobic exercise.) But you’ll notice a big difference when you do plyometric work on the STEP. You’ll be able to jump higher and remain airborne longer, which kicks up the intensity. It adds a new dimension to jogging workouts too. Be sure to pay attention to form and how you land. Even though the landing may be softer, always bend your knees to protect your joints. The following five exercises for the STEP, which attaches easily to the base of any Total Gym, will take your workout to a new level. You can also circuit train by using the Total Gym STEP between strength exercises to enhance the aerobic activity of the workout. Unhook the cable pulley and adjust the height on the column to one that’s challenging. Insert the safety hitch pin. Lay on the glideboard with your head toward the column and your feet on the STEP. Be sure your hair and clothing are secured so that nothing gets caught in the rails. The STEP is split in the middle for single leg work, so caution should be used to avoid placing the feet in the space. Warm up with some dynamic stretches. Cool down with static stretches after completing your workout. Bend your knees into a squat then push off the STEP with the balls of the feet. Land softly with knees bent. Return to squat position. This is a plyometric exercise targeting the muscles in thighs and calves. 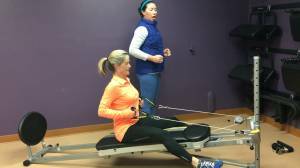 Contract your center and keep your spine pressed into the glideboard. Lift one foot at a time into a high knee. This can be a plyometric move if you push off the STEP forcefully. If you do it quickly, you will feel like you’re jogging, which is an aerobic activity. Or it can be low impact if you place your foot on the STEP gently before raising the other knee—more like marching in place. You’ll be using your quads (when you flex at the hip and knee), hamstrings (when you straighten/extend the leg at the hip), calves and core muscles. Bend your legs into a squat then press off the STEP forcefully as you bring your knees up to your hips or even chest-level. Land softly with flexed knees. 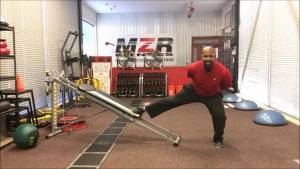 This is a plyometric exercise targeting your quads and core. Press off the STEP forcefully and extend both legs out to the sides while raising the arms to shoulder-height. Bring the arms back to your sides and bring your legs back to midline, landing gently on the STEP with flexed knees. This exercise targets the shoulders, gluteus medius and minimus, the inner and outer thighs, and the calves—a very versatile and effective combo. Just like in hopscotch, press off the STEP with one foot and land with a flexed knee on the same foot. The other knee is bent to 90 degrees. Perform at least 8 on each side. This exercise engages the muscles of the buttocks, thighs and calves, along with the core; and it’s plyometric, so it burns lots of calories. And it’s fun! No reason why you can’t have both! I love the new step platform for performing the cardio (running and plyo moves) on the total gym. I’ve had problems with my ankles in the past and the new platforms makes these moves less taxing on my ankles. Thanks! Great Veronica! We developed this attachment just for people like you! We are glad to hear that it’s working out well for you. I have the total gym supreme. I got the cycle trainer attachment. LOVE it and I’m getting this step attachment cuz I want to run and work on my martial arts kicks. The CycloTrainer is a great accessory isn’t it! We are glad to hear you’re getting the most of your Total Gym Supreme! Let us know if there’s anything you need in the future! i have one of the first gyms out there… 🙂 It’s too old for the squat attachment…….would this “fit” onto my 1000??? Please say yes!!! Well Brenda, unfortunately, the STEP attachment uses the same holes at the base of the Total Gym as the other Total Gym base attachments like the squat stand. We are currently partnering with QVC (on QVC.com) to offer a lower-priced model ($300 or 6 payments of $50 + S&H), the Total Gym Ultima, that includes all sorts of attachments and what-not. It’s worth checking out, as you’ll gain the ability to have the STEP and any other future attachments that would use the same holes. You can purchase those items separately. Also, are you asking if it can fit a 7’5″ person comfortably? I have the total gym ultima. Will the step attachment work with the Ultima? Hi I want to purchase the new Total Gym Step Attachment for my new Fit. Can you send email when they are back in Stock? Also how much longer will the sale last for them? Thank you!